What does it mean to “make” something? The maker movement encourages us to invent, design and tinker with things. 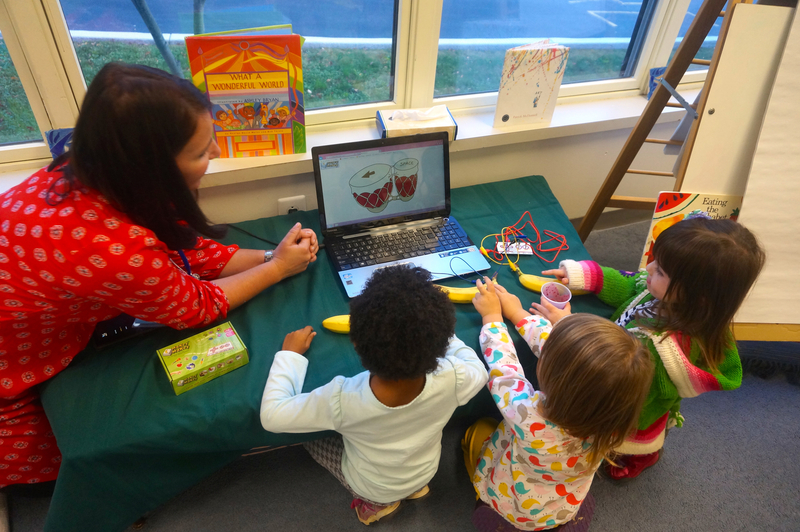 At Wilmington Montessori School, our Maker (STEAM) Studios are hubs of activity. Children are learning about their brains and how they work. Toddlers are working with new tools, learning to operate locks and lights, and creating ramps and tunnels for balls to move through. Primary students are creating music using a banana and electrodes. Others are writing code and giving directions to a robot, watching it move haltingly across the floor. They are hubs of activity. Ideas are being explored, mistakes are made, experiments occur (intentionally and not), and learning is happening. As children participate in their learning, there must be time to think and follow their own ideas. They are encouraged to try new things or do familiar things in different ways. They are privy to others’ ideas, asking questions to build on their own. Our Maker Studios are extensions of our classrooms. The same Montessori principles that apply to the classroom apply here. Children are given the opportunity to design and create their own learning, guided by an adult who observes and offers just what is needed at the right time.